Turtles Tied To Salmonella Outbreak In 13 States : Shots - Health News The government is warning people not to handle tiny turtles because of the risk of contracting salmonella. The problem is, it has been warning us for 40 years and we're still getting sick. 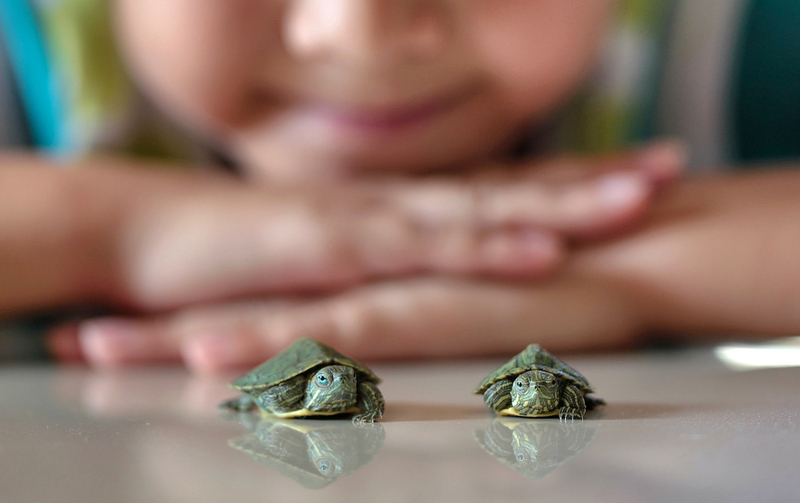 Tiny turtles are cute, but they can spread salmonella and make children very sick. The Teenage Mutant Ninja Turtles series has been around for decades and has raked in millions of dollars in merchandise. Why? Because turtles are cool. Warnings about real live turtles giving salmonella to the people who handle them have also been around for decades, but people keep getting sick, and that's not cool. The Centers for Disease Control and Prevention issued its latest alert on Tuesday, saying a multistate outbreak of salmonella Agbeni suspected of being spread via turtle-human contact has sickened 37 people in 13 states since March. Nearly half of those infected have been hospitalized, which is "a little bit higher than we typically see," says Megin Nichols, a CDC veterinarian who investigates these kind of outbreaks. Also, about one-third of the victims have been kids younger than 5, who are more susceptible to getting sick because of their little immune systems and, well, hygiene. The federal government has banned the sale of the tiniest turtles — those under 4 inches long — since 1975 because they can spread salmonella. But it seems that the little critters, which can still be found at flea markets and outdoor markets, are too irresistible. The baby turtles are responsible for much of the salmonella because young animals tend to be stressed more when they are handled. That means that if they have salmonella, they are shedding it everywhere in their environment, Nichols says — on people, on their food, in their water and in their cages. Someone touches it and doesn't wash their hands thoroughly, then bingo: infection. Salmonella infections can lead to abdominal pain, diarrhea and blood in the stool. If you experience any of these symptoms, especially if you've come in contact with a reptile recently, call your doctor, Nichols says. Responsible pet stores sell larger turtles and hand out information about salmonella to help prevent illnesses, Nichols says. If all of this sounds achingly familiar, it is. We reported back in 2009 about a salmonella outbreak in the previous two years that sickened more than 100 people. That investigation got started when two girls reported illness after swimming with turtles in a backyard pool. We reported in 2015 about a Pediatrics journal account of eight outbreaks across 41 states, covering 473 illnesses. Some 28 percent of the people sickened had to go to the hospital. Heck, NPR reported about salmonella in pet turtles on the air way back in 1971. Despite the frustration of continued outbreaks, the CDC's Nichols says the number of illnesses we see now is much smaller than it would be if the tiny turtle ban and warnings were not in place. Otherwise, "hundreds of thousands of people could be sick," she says. It's important for people to know that pet turtles and other reptiles can lead healthy, happy lives with their adopted families, Nichols says, as long as they are cared for properly. But the CDC recommends reptiles and amphibians not be part of a family with small children.